In the Physical Device Scan View select a scan result node with detected partitions. From the toolbar, click Partition Filter. Right-click the partition and click Partition Filter from the context menu. Set filter values in General or Advanced tabs and click Filter to apply selected filter criteria. 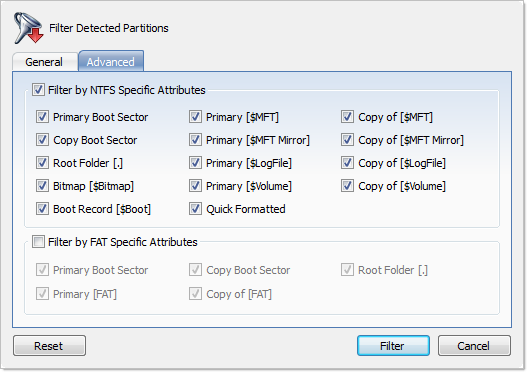 Advanced tab filtering will let you filter a partition with specific NTFS or FAT attributes.